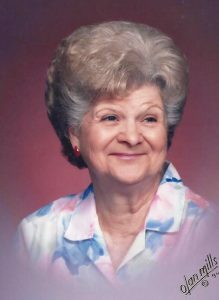 Mary Marie Blevins, age 92, of Prospect, passed away Wednesday, November 28, 2018 at Marion General Hospital surrounded by family. Mary was born, one of eighteen children, in Marion, on April 9, 1926 to the late Wilson and Elsia (Bramen) Schroll. Mary met the love of her life, John H. Blevins, while he was staying with his cousin who happened to live next to Mary’s parents. The two were wed September 1, 1945 in Greenup, Ky. Together, the two raised five children taking many family vacations hunting and fishing in Michigan. In later years, the two spent summers at their lake houses in Snug Harbor and on Catawba Island. John passed away in 1993. After the passing of John, Mary found companionship with a life-long family-friend, Tony Galati. The two were able travel across the United States and even visit Hawaii. Mary and Tony enjoyed going out to eat whenever possible and spending time at the Eagles dancing the night away. Mary was warm-hearted and firm always making sure her children had what they needed. She was an excellent care giver for her son Steven, after his accident, until his passing in 2015. She made sure he had everything on his shopping list even if it meant going to several store to find the best bargain. Mary will be missed by children, Marsha (Gary) Smith, John (Mary) Blevins, and Larry (Judy) Blevins all of Prospect, seven grandchildren, along with many great-grandchildren, great-great grandchildren, nieces and nephews; and brother, Dan (Shirley) Schroll of La Rue. Mary was preceded in death by her parents, husband John, children; Linda K. Maynard and Steven R. Blevins, step great-grandson, Brandon Reinhart, and sixteen siblings. Visitation will be held Monday, December 3, 2018 at Snyder Funeral Homes, Gunder/Hall Chapel from 10:30 am until a 12:30 pm funeral service with Rev. Wes Craker officiating. Burial will follow in Prospect Cemetery. Memorial donations may be made in Mary’s honor to St. Jude’s Children Hospital or American Cancer Society. Snyder Funeral Homes of Marion are honored to serve Mary’s family. Online condolences may be expressed by visiting www.SnyderFunralHomes.com.